Notes: Milton Road Halt was opened in 1906 and closed in 1916 as an economy measure during WW1. 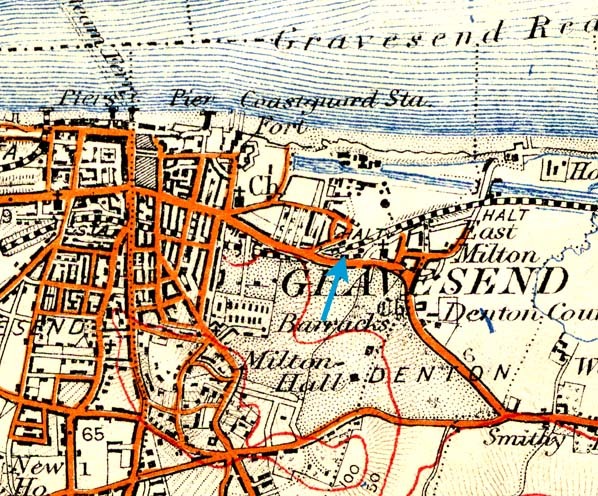 Because of its close procimity to Gravesend Central Station it nwas never popular and consequently was not reopened after the war. It was quickly demolished. To see the other stations on the Hundred of Hoo Railway Line click on the station name: Denton Halt, Milton Range Halt, Uralite, Cliffe, High Halstow Halt, Sharnal Street, Beluncle Halt, Middle Stoke Halt, Stoke Junction Halt, Grain Crossing Halt, Grain, Port Victoria & Allhallows-on-Sea.